Tired of Waiting for SQL Server Management Studio to Start? Have you noticed that sometimes SQL Server Management Studio takes a really long time to start up? I’ve found it can take up to half a minute or longer, which is really annoying if you tend to use it regularly. A few weeks back I was doing some work on a customer site with Tracey Davis from SQL Services and she gave me this handy tip to speed things up. On the machine displaying the slowness, open up Internet Explorer. Go to Tools -> Internet Options -> Advanced and scroll down to the Security section. 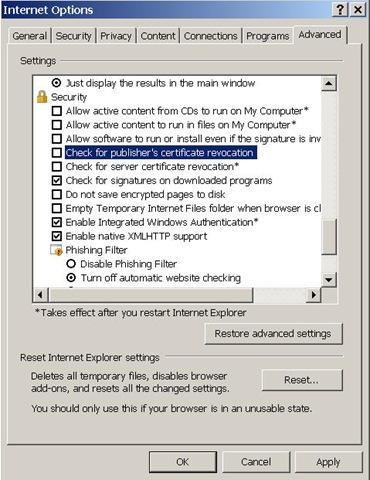 Uncheck the "Check for publisher’s certificate revocation" checkbox and apply the change. After this your SSMS should start much more quickly. The reason why this works is that SSMS contains signed code. When you start up the program it tries to check that the certificates used to sign the code are valid by looking up the certificate revocation list at crl.microsoft.com. If the computer from which you are launching SSMS does not have an Internet connection (or cannot contact crl.microsoft.com) the resulting timeout delay causes the slowness. 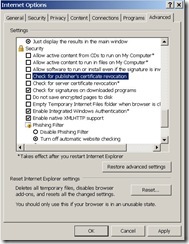 If you don’t want to mess with your IE settings, another option would be to add the following line to the hosts file on the affected machine. This has a similar affect of improving the startup speed of SSMS. Posted by T on June 30, 2008 at 12:09 am under SQL Server.